In addition to locally manufactured custom holsters, we also offer tailored leather magazine carries. Pick one up with your leather holster, or separately down the road. We can customize the magazine carries to match your holster, just provide a detailed picture. 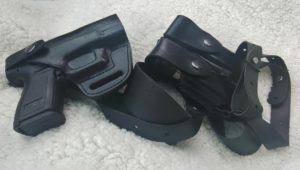 We do offer discounts for purchases over $150, so consider picking up your magazine carries, with your gun holster to get the best bang for your buck.